Provide small songbirds a cheerful, vivid roost by adding this Home Bazaar Sunflowers Hanging Wren House to your yard. The traditional, diamond shape, wooden construction, and shingled roof make this home a fantastic addition to your backyard, while its bright finish is sure to capture attention. The pale blue body of the home evokes the sky, while a wealth of sunflower shapes adorns the sides of the unit for added style. A chickadee figure in flight hovers slightly above the flower artwork, lending a bit of movement to the unit. A 1.125" diameter entry hole rests above the flower shapes, sporting a bright yellow, raised border for added interest. Matching yellow trim beneath the pitched roof furthers the vivid look, and the wooden shingles on the item add fantastic detail. Gaps beneath this roof overhang help the home remain ventilated, and its flat base slides outward for seasonal cleaning. Use the attached chain to hang this shelter from a hook, or place it against a post or wall with its preinstalled keyhole hanger on the back. The wooden body offers weather resistance, while the bold print captures attention. 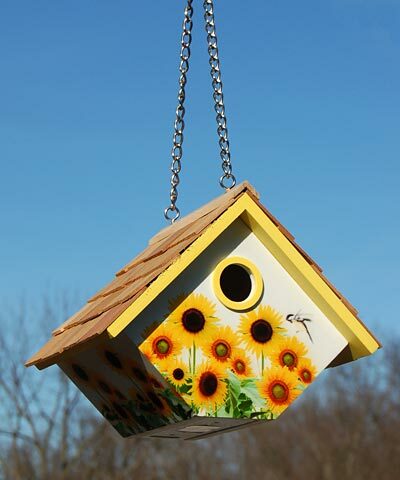 Enhance your garden with cheerful flowers on this Sunflowers Hanging Wren House.